Posh midfielder Chris Forrester has been cut from the Republic of Ireland squad. Photo: Joe Dent/theposh.com. Peterborough United midfielder Chris Forrester has been cut from the Republic of Ireland squad for next weekend’s friendlies against Switzerland and Slovakia. This means the 23 year-old will now be able to play for Posh in their League One clash with Coventry at the ABAX Stadium on Good Friday (March 25). 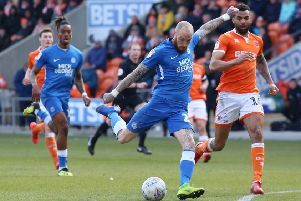 Forrester had been included in a provisional 40-man squad by Ireland manager Martin O’Neill, but that squad was trimmed to 33 today (March 20) and the Posh man was one of the seven to miss out. It was Forrester’s first inclusion in a senior squad and his chances of playing in the Euro 2016 Finals in France this summer are probably over. Posh will be without Michael Smith (Northern Ireland), Kgosi Ntlhe (South Africa Under 23s), Martin Samuelsen (Norway Under 21s) and Gaby Zakuani (DR Congo) because of international call-ups for the Coventry fixture. The Sky Blues will also be missing key players for the same reason, including top scorer Adam Armstrong.